This week I DID start another project. I'll call it Parallelogram Strings. Basically it's a little crib quilt that will help me tackle the strings in my string basket. This is what the string block looks like before it is cut with the Accuquilt die. I finished all of the blocks for January, 2019, for the Temperature Quilt Along. I am making kite blocks in specific colors for the high and low temperatures for the day. I sewed them all together in one row for now. This is not how they will end up. I wanted to keep them together and in order. Most likely I will stitch rip one seam and combine the rows the desired width. I haven't decided how that's going to work just yet... Rows for January and then a blank piece to fill in the rest of the month in the average color, separated by a 2.5" strip? Don't know yet. I need to do some math/planning. I'll be working on this embroidery bear crib quilt this month as my OMG project. I made two Owl's Well That Ends Well blocks in yellow today to participate in the RSC19. I had an unusual Friday finish. This is a dog sled that our son had to build for a 5th grade project. I did some sewing on the raised platform and the straps. 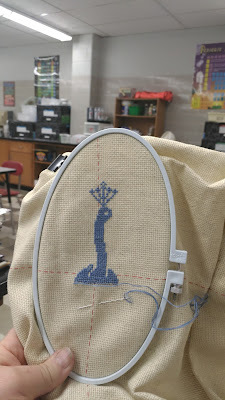 I stitched on my Sunday Slow Stitching project in my sew-to-go bag. I'm still working on the January clue. I'm going to move on to the February clue ASAP and eventually go back to the January clue. The February clue is an outline of where the other clues will go. It will be pretty important in the up-coming months. I started another new project this week. It's called Parallelogram Strings -- 2019 String Along at Humble Quilts, started 1.31.19. I have 70 projects in the works. I'm linking up at Silly Mama Quilts. Check out the giveaway!!! I'm linking up at Esther's Quilt Blog for WOW! 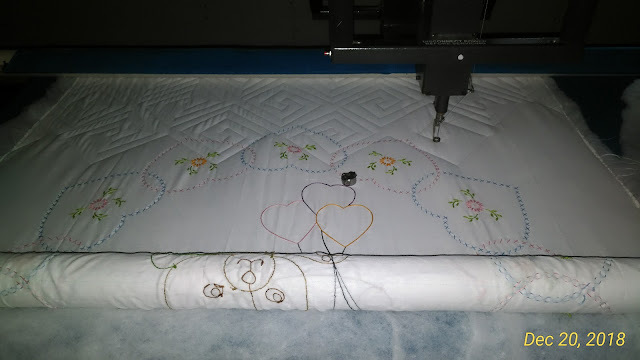 I'm linking up with Susan at Quilt Fabrication for Midweek Makers #161.
awww....thanks so much for the shout out! !